Social media is a powerful tool for connecting with an audience and creating vocal brand advocates, especially when you’re offering them a reward or prize. I saw two examples of this recently with the American Airlines / US Airways / Hilton contest last week, and the Club Carlson promo the week before. It appears that Marriott is getting into the game with Marriott Rewards and a new program called “Plus Points“, which runs from today through November 8, 2014. Marriott Rewards members can earn up to 2,000 Rewards Points per 30 days for participating in specific social media tasks on Facebook, Twitter, Instagram and Foursquare. This includes “liking” pages which is the most lucrative at 250 points per property and also sharing social media content, checking in at specific properties and using unique hashtags (e.g., #LoveMarriottRewards) for 25 points each. My goal would be to like 8 different hotels per month to hit 2,000- there are about 50 participating properties and hopefully more join as time goes on. 2,000 points at about 1 cent per point = $20 per month for liking 8 hotels, which should take about 2 minutes. Not the worst point payday! After discussing travel with Marriott points only yesterday, these points seem like a great way to boost your account. Not all properties are eligible for this promotion, so take note of the program rules to make sure this promotion works for you. Rewards members electing to earn miles are ineligible for this promotion, so it’s points only. Ritz-Carlton Rewards members are also ineligible. 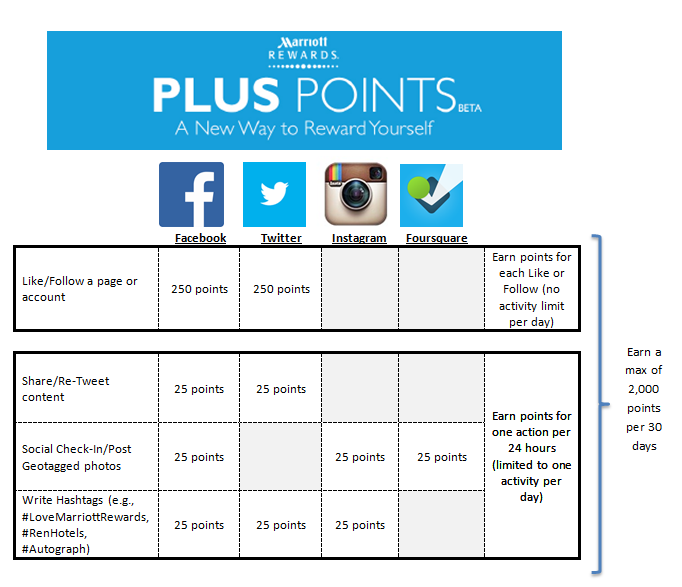 Marriott Rewards Plus Points redemption chart. You will receive a confirmation page and will be prompted to link your other social profile accounts (Twitter, Instagram, Foursquare). You can link all 4 of your social profiles to Plus Points by linking one at a time on this confirmation page. If you are not a member of Marriott Rewards, you can sign up here. If you want to add even more to your Marriott point balance, consider signing up for a Marriott credit card. The Marriott Rewards Premier card will get you 70,000 points after you spend $1,000 within the first 3 months (the business version comes with 50,000 points after $1,000 spent within 3 months), and the basic Marriott Rewards card will get you 30,000 points after $1,000 spent in the first 3 months. Add in the 2,000 that you can earn through Marriott Rewards Plus Points and you’re getting some serious points!